The Boystown Chicago district is an area that can be found on the north side of the city within the neighborhood of Lakeview. 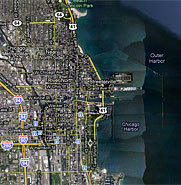 Its unofficial borders are formed by Belmont Avenue, Broadway, and Halsted Street. To the immediate north of Boystown is the Wrigleyville district, which is where you will find Wrigley Field. The area in general has an inviting atmosphere and is known for its nightlife. Boystown in particular is also known for its relatively large GLBT community. Every year in June, the district plays host to the Chicago Pride Fest, which is a multi-day, GLBT pride celebration that is capped off by the colorful Pride Parade. Another major event that takes place every year in Boystown Chicago is the Northalsted Market Days. This two-day street festival takes place in August and might just be the largest bash of its kind in the Midwest. In the 1930s, 40s, and 50s, Chicago’s gay community mostly called the River North area home. As River North developed into an up-and-coming neighborhood, rent prices rose to the point where many of its gay residents were priced out. What is now colloquially known as Boystown started to become the new heart of Chicago’s gay community. The subsequent transformation of the area was quite a dramatic one. In the 1970s, Boystown was little more than a crime-ridden pocket. Today, it is wonderfully vibrant and features many shops and restaurants. It should be noted that while Boystown Chicago is still very much a hub of the city’s GLBT community, the district’s gay population probably isn’t as highly concentrated as it once was. As was the case in River North, rising rent prices have caused many members of the GLBT community to move elsewhere, such as the Edgewater and Andersonville areas. Also, as is true across the country in general, gay people in Chicago feel less of a need to "seek refuge" in certain communities. This has resulted in a wider dispersion of the gay community throughout the city. While the Boystown Chicago district is full of shops, restaurants, and residential properties, it doesn’t boast a high number of hotels. There are some lodging establishments in the area, however. Among them is the Best Western Plus Hawthorne Terrace, which can be found in Boystown at 3434 N. Broadway. Three other hotels that can also be found in or near Chicago’s Boystown district are the Abbott Hotel (721 W. Belmont), the City Suites Hotel (933 W. Belmont), and the Majestic Hotel (528 W. Brompton Ave). For those who wish to expand their area lodging options even more, there are several hotels to the near south of Boystown. These hotels are clustered in and around the intersections of N. Clark St., W. Diversey Pkwy, and N. Broadway. Examples include the Days Inn Chicago (644 W. Diversey Pkwy) and the Inn At Lincoln Park (601 W. Diversey Pkwy). There are plenty of bars to patronize in Boystown and the surrounding area. This explains why you can expect to see plenty of people out on the streets on any given night. The area bars also draw in a considerable crowd during the day when there is a Cubs game or some other special event going on. Plenty of the bars in and around Boystown serve food as well as drinks, and there are even a few that allow customers to bring their own beer or wine. Within Boystown proper, there are some long-running gay bars that are worthy of note. They include Little Jim’s, Sidetrack (pictured), and Roscoe’s. Little Jim’s can be found at 3501 N. Halsted and is somewhat of a pioneer. It opened in 1975 and was one of the first gay businesses, if not the very first gay business, in the Boystown area. Sidetrack can be found at 3349 N. Halsted St., or where it likes to call "The Heart of Gay Chicago." It opened in 1982 and has grown considerably since then. Roscoe’s, or Roscoe’s Tavern & Café, as it is more officially known, opened in 1987 and can be found at 3356 N. Halsted.